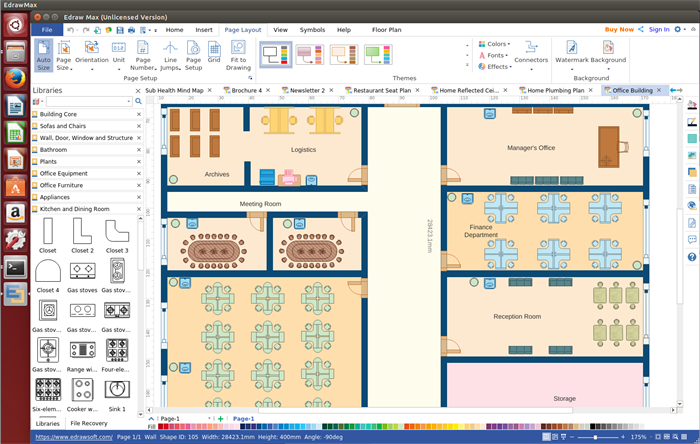 Edraw is a full-suite office layout software for Linux, which enables users to create 12 types of floor plans apart from office layout. Edraw is an all-powerful office layout software which can work on Linux while other software can not. It is the most time-saving and energy-saving software which enables users to be hands free by prepares almost everything in advance, such as built-in symbols & templates, drawing tool and necessary function buttons. Following features of Edraw make it deserve the name of the best office layout software for Linux. It is an all-inclusive tool that supports engineerse with all aspects of their daily works, including office layout, electrical plans, home plans, seating plans, security and access plans, etc. This Linux office layout software offers thousands of built-in vectot office layout symbols for users to drag, drop and edit. People with or no drawing skills can create professional plans. 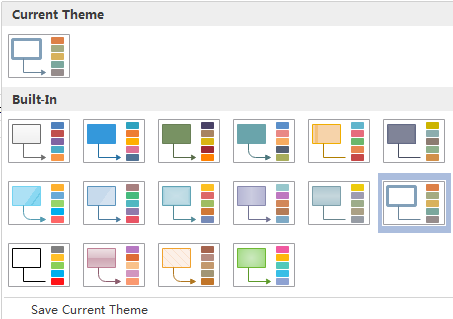 It simplifies the layout drawing process by providing well-designed templates to help users get started quickly. To make plans more attractive and resourceful, Edraw supports inserting hyperlinks, attachments and notes, which enables audiences to have a better visual experience. 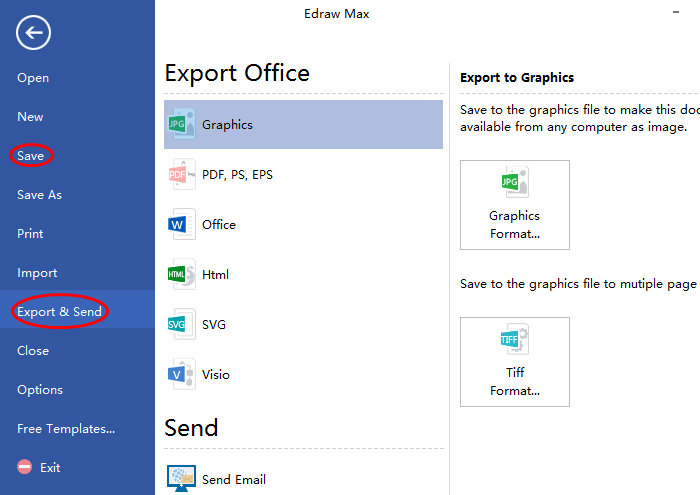 The another feature of Edraw we can not overlook is it supports saving and exporting files to common formats, which helps users share with others more conveniently. 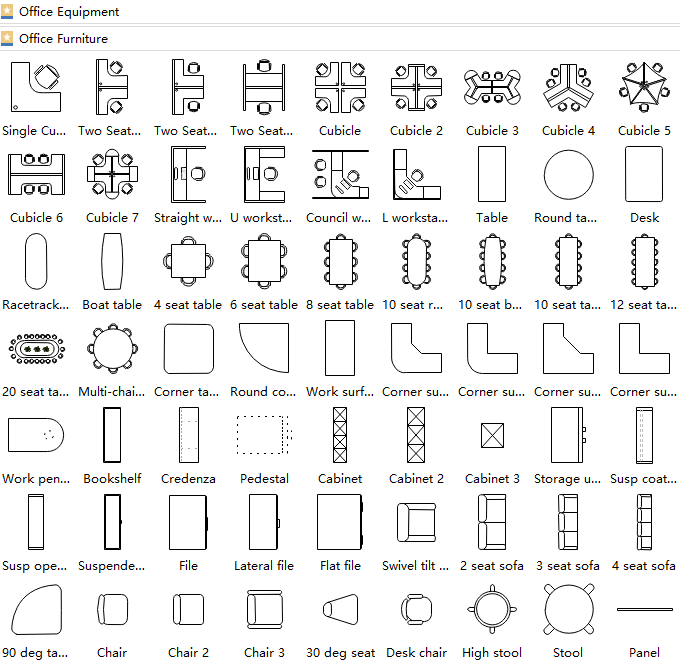 There are numerous pre-made symbols in the libraries of Edraw office layout software. Here lists part of them in below picture. All the symbols are free to edit. Users can easily customize them to fit their own situations. And Edraw never stops creating more fresh elements. 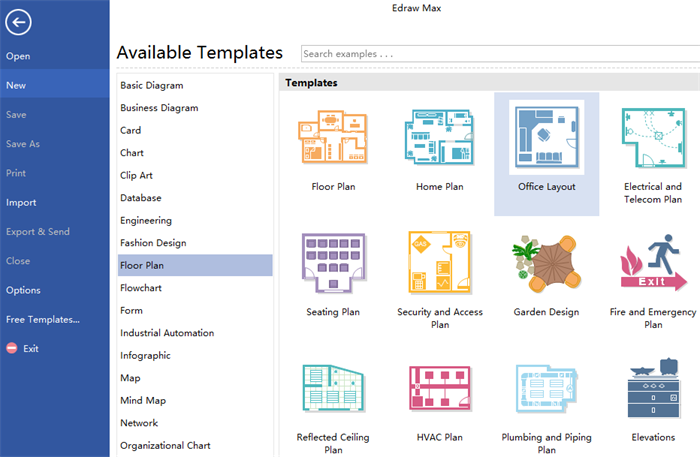 Creating office layout with Edraw can be easily finished by following simple steps. Firstly, launch the software, go to File menu > New, then click Floor Plan and double click Office Layout to open a blank drawing page. Secondly, navigate to Floor Plan menu and set your drawing scale in the first option button based on your own situation. Thirdly, go to left libraries, drag proper symbols and drop on the drawing page. Just edit them if necessary. 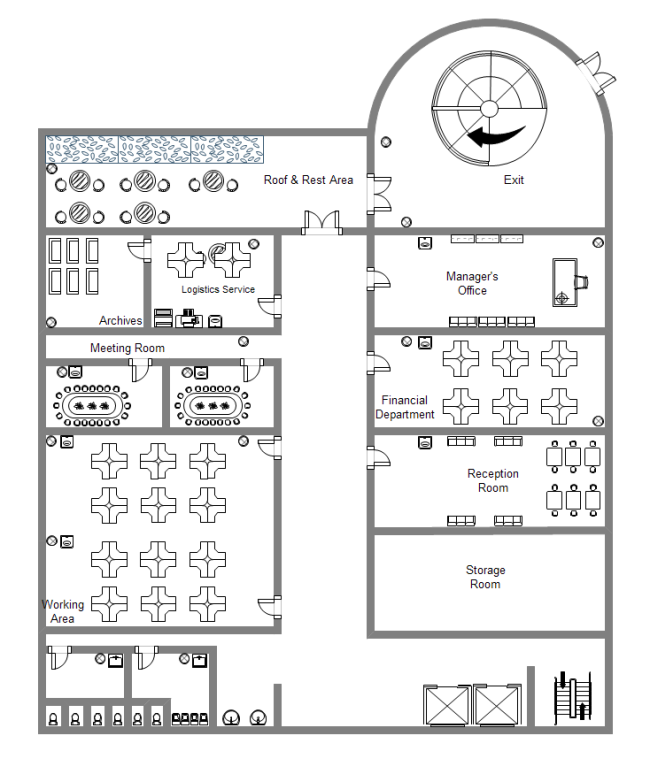 Lastly, save or export the office layout. Users can click Save on File tab to save the layout as default format .eddx, or hit Export & Send to export it to some common formats for sharing conveniently with your colleagues or friends. 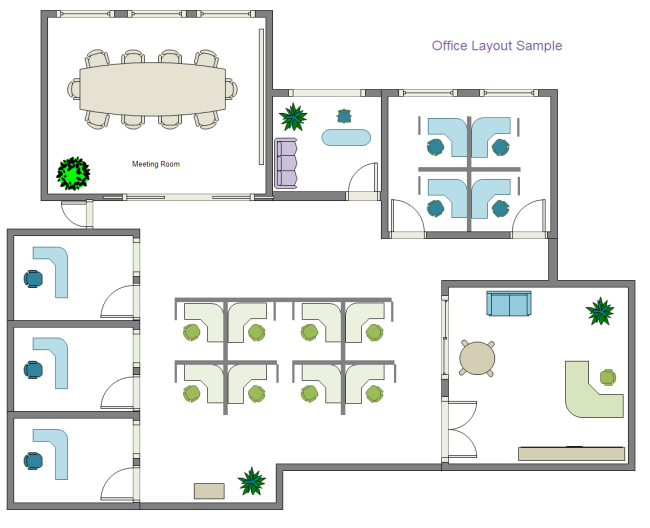 Here are three examples of office layout and all the examples are free to download and edit, so just download them if any need or interest. 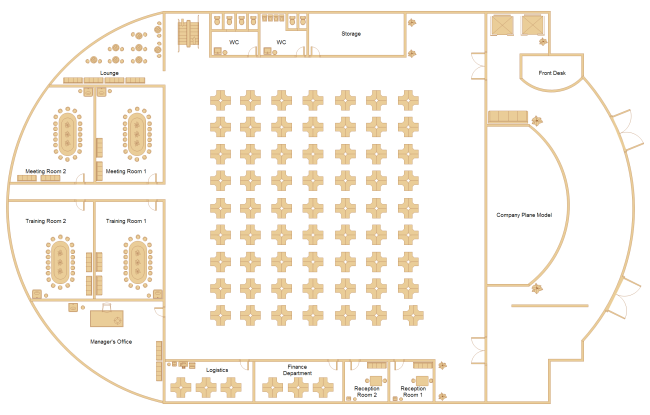 This is a typical office layout example that suits most small companies, people can easily know where to put the meeting room and working section from the layout. Here comes a office building sample for those big companies who want to construct their own company building. It clearly shows us the detailed position of different department. Welcome to download if anyone has the building plan. Below office plan is also suitable for middle or big companies which need large area. The feature of this plan is it gathers almost all the employees to work together for convenient management.